For worlds my people may embrace. Have they planets like my home? Are they frozen stone - or do they still burn? Taking with it all I knew. What I wouldn't give again to see that blue. Find you guilty of breathing our air." What can you mean my friends? No passage papers - you're stealing our life's breath. We have none to spare." How can you be such fools? With creatures similar to man. Or will they accept my hand? Or will they fear and kill what they don't understand? We study higher belief systems, not to parrot them back or to make them our habit, but to awaken the living origin of all belief systems within us. Once that is accomplished,and we begin to act on our own authority, those who follow the group mind may misunderstand and even persecute us. 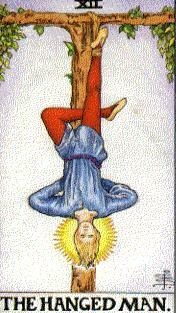 The lesson of the Hanged Man is to believe in ourselves even when we are surrounded by opposition, and to act on our beliefs rather than sacrifice our authenticity to the prevailing wisdom.